More than 1,000 people die from the condition each year. There was a big increase in asthma prevalence in the Eighties and Nineties; it increased by 400 per cent over 25 years according to Asthma UK, but some recent research suggests prevalence may have levelled off. In an asthma attack, the smooth muscle around the walls of the airways - small tubes that carry air in and out of the lungs - tighten and narrow. The lining of these airways gets inflamed and starts to swell, a sticky mucus is produced, and the narrowing and irritation lead to the symptoms of asthma: coughing, wheezing and shortness of breath. There is no cure and the main drug treatments - relievers or bronchodilators, which relax the smooth muscle of the airways, and controllers, corticosteroids, which reduce inflammation over time - tackle the symptoms rather than the cause. The technique, bronchial thermoplasty, is for patients with moderate and severe asthma. It is designed to have a similar effect to the relievers, but by using heat rather than drugs. 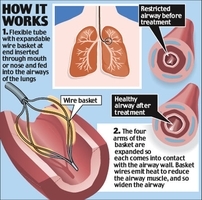 It keeps the airways from narrowing by preventing the smooth muscle from contracting-The device consists of a small flexible tube with an expandable wire basket, like a mini food whisk, at the working end, and a controller that delivers thermal energy and heat to the wall of the airways. A flexible tube carrying the device goes through the mouth or nose. No incision is required, and the patient is under conscious sedation with no anaesthesia involved. In the outpatient procedure, which takes about an hour, the tiny device goes down the tube and into the airway. Once in position, the four arms of the basket are expanded so each fits snugly against the airway wall wherever treatment is needed. The arms of the basket then deliver controlled thermal energy for about ten seconds to heat the airway's smooth muscle to a warm temperature that causes no pain. Exactly how it works is not clear, but heat is known to relax muscles and it is thought the heat reduces the amount of smooth muscle around the airway, which in asthma tends to increase and be hypersensitive. The tiny device is then repositioned to carry out the procedure on the next section of the airway. That process is repeated over about 40 minutes, moving the device a few millimetres each time. Patients have three sessions of the treatment at three-week intervals, and each time, one third of the lungs and airways is treated. An international trial involving 300 patients is under way. Results from a small pilot study suggest it can be highly effective. Two years after their last treatment, the patients were still showing less airway narrowing. Neil Thomson, professor of respiratory medicine at Gartnavel General Hospital and the University of Glasgow, who leads one of the trial centres, said: 'The early results were encouraging, and the fact that the improvement in asthma symptoms lasted suggests it is an effect of the treatment rather than anything else. This page contains a single entry by ID Admin published on December 5, 2006 11:07 AM. Late start to European winter troubles skiers, bears and asthma sufferers was the previous entry in this blog. Kids With Asthma: Obesity More Likely is the next entry in this blog.